Gingerbread has held a significant place in my life more than once. The first time was when I was five years old. My Mom, who taught me how to bake and was always encouraging in the kitchen, had decided we would make gingerbread men for the winter holidays. I deliberately wrote that as “gingerbread men” as that is what they were called back then. Nowadays we usually see them referred to as gingerbread people, at least here in very politically correct Amherst, Massachusetts. Well, I guess I was ahead of my time, because not only did I want to make gingerbread people, I wanted to make the women with breasts and the men with penises. How else would we tell them apart? This seemed logical to me. My Aunt Estelle, who had no children of her own, was witnessing this biology lesson. She was horrified and perplexed. How could my mother not only allow, but encourage me in such an endeavor! It just didn’t seem appropriate to her. Bless my Mom. She knew it made sense. Didn’t women and men have such accouterments? Wasn’t teaching children accurately a responsible approach? My Mom had the last word and my gingerbread men and women were created and shared in all their enhanced glory. When I was seventeen I decided to make my first gingerbread house. My friend Gordon had worked in a bakery, so he seemed like the perfect baking partner. My Mom gave me free reign of the kitchen. By the time we finished it looked like a large bag of flour had exploded in the kitchen. Mom never made a peep. The house came out well enough. Gordon showed me how to use royal icing to help camouflage any less than straight edges and glue the walls together tightly. We decorated it with candies and sugar snow and were quite proud of ourselves when we were done. Now what to do with it? It was shortly before Christmas school break. I decided to give it to my friend Katie as a present. The school break came and went and Katie and I returned to school in early January. Katie approached me, envelope in hand. I opened the envelope to find a series of pictures that elicited immediate laughter. Katie, you see, had a pet opossum named Priscilla that lived in her NYC apartment, along with her cats and dachshund. Priscilla used to eat cottage cheese and cat food and there were several empty hanging planters around the apartment where she would lounge, exposing her tubby belly and long, rat-like tail. She was ugly-cute, if you know what I mean. Katie had told me that they bought her from a place down south where they were bred for food. She also educated me to the fact that 20 opossums can fit in a teaspoon at birth! It is very funny to think that this is one of those odd bits of information that my brain has decided to hold onto all these years. The photos showed Priscilla coming down on top of the gingerbread house with her large jaw and sharp teeth taking a nice big bite out of the peak of the roof. Each photo showed a different angle and perspective of the destruction and I couldn’t help but giggle and eventually laugh out loud. All I could think of was Godzilla destroying buildings with ease. This, of course, was in the days long before digital cameras and I have no idea where those photos are now. My final gingerbread chapter involved another house, this one much more grand in scale and elaborate in decor. I doubt that I will ever build such an elaborate, fragrant, edible structure again. It was mid-fall and I got a call from my Today Show producer who asked me if I would take part in the upcoming Christmas Day program. This was apparently the only show of the year that they taped. Taping would be early December and the topic was fantastic holiday desserts. She wanted really over the top stuff. This wasn’t going to be about recipes or teaching the viewer how to make the item at home. She wanted drama and inspiration; desserts that would look like they belonged in Macy’s Christmas windows or the set of the Nutcracker. I suggested that I make an extravagant gingerbread house. My first step was to call my food stylist/buddy extraordinaire, Liz Duffy and enlist her help. Liz had worked on my first wedding cake book and I found her to be precise and exacting, which is just what I needed for this endeavor. I told my best-friend and baking muse, Mary, what I was up to. She cleverly suggested I talk to Cecil, her neighbor, who was an engineer and might be able to help with a design. Next thing I knew, I was in Cecil’s basement and he was pulling out the actual blueprints from his country home, a lovely two-story New England farmhouse with a large wrap around porch. We decided to scale it to about a two –and-a-half foot square and I began coming up with more and more interesting decorative details. My bosses at Bon Appetit graciously allowed me to use their kitchen in the Condé Nast building for the construction. Liz and I made plans to meet there three days before the taping. 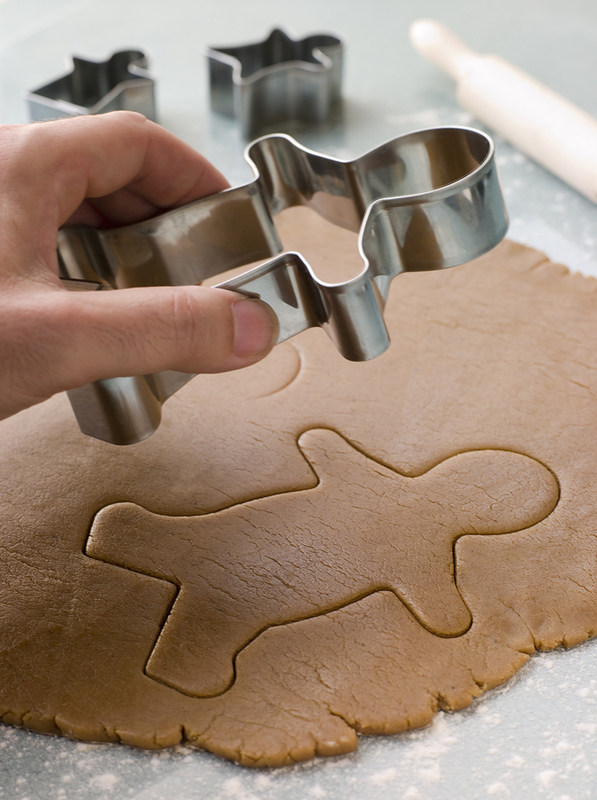 She was going to arrive first and start making the gingerbread dough. I would join her a couple of hours later as I had to make my way down to the city from Massachusetts. I arrived at the building, where my name was listed with security, and after an official check-in process, I was free to go up to the fourth floor. My Bon Appetit cohorts had told me that was where I could find the kitchen. The elevator door opened and I walked out onto the floor, but no one was in sight. I walked down a hall and saw a lone person. I called out to them and asked them if they could direct me to the kitchen. They were happy to oblige and led me down another hall and gestured to a door. I don’t actually know if I finished that sentence because the second I said “Bon Appetit”, the woman I was speaking to placed her hands on my shoulders, physically twirled me around toward the door, put her hand at the small of my back and started gently pressing and escorting me out of the kitchen. By then I was in the hall, the door had closed behind me and my head was reeling. Bon Appetit and Gourmet might both be Conde Nast publications, but they are main competitors. I had been behind enemy lines! No Bon Appetit employee would ever be invited into the Gourmet kitchen. If only I had known where I was when I was in there, I would have paid closer attention to what they were working on. I didn’t have any more time to waste thinking about potential espionage. I finally found the Bon Appetit kitchen and Liz, as expected, was hard at work. We baked for hours and got all of the pieces we would need rolled, measured, cut, baked and cooled. The second day would be for constructing the house so that it could sit overnight and the icing glue could set. Then, on the final day, we would decorate it. Liz and I usually enjoy one another’s company, although we go through moments of tension where I want to have a final say about a detail because I’m the “talent” and the face of the segment and she wants to lay down the law because she’s the stylist and knows what works best. We always work it through; compromise is key. Liz knew a place in Chelsea that would cut a wooden board to our specifications to support our house. Once all was said and done, this was going to be a heavy, substantial structure and we couldn’t afford for there to be any flex to the board whatsoever. By the end of the first day we had the dimensions of all of our pieces and Liz and I decided on the size of the board, which I picked up. By the second day, the house was up and there was plenty of room all around it to make our planned walkways, pond, fences and what have you. All of a sudden, Liz looked at me with an odd expression. I knew something was wrong. “Look at the door,” Liz said, her eyes gesturing across the room. I glanced over at the door to the hallway. It took me a moment but I realized the issue. The house and its board were not going to fit through the door! Uh oh. Long story short, we were in the midst of a snowstorm, it was Christmas shopping season, there were no taxis to be had, but somehow, hours later, braving the weather, I got down to the wood shop and got another, narrower piece that somehow still provided enough room for the house. After each of us spent over thirty hours over three days on the project, we were done. And I have to say it was nothing short of spectacular. The yard featured a pond and walkway. The roof was covered with snow. The porch had a hanging swing made of licorice and pretzel sticks. There was a mailbox with Katie Couric’s name on it spelled with alphabet pasta, a street lamp designating the intersection of (Al) Roker Street and (Ann) Curry Lane and a welcome mat that said “Welcome Matt”, again in pasta, as a nod and joke toward Matt Lauer. It was time to deliver the house to the NBC set; we had a moving truck waiting on the street and we carefully slid the house and board onto a table-height dolly on wheels. It went through the door with just inches to spare. We took it downstairs in the elevator, wheeled it through the marble lined lobby and realized we had stairs to navigate. There was no way at this point, after all that work, that we were going to risk cracking it or dropping it. I looked around and saw the handicap elevator to the left of the stairs. It was one of those small, open elevators where you open a half-door, walk onto the platform, and it goes up and down the short distance. We asked to use it. The security guard said no way. We tried to persuade him, to no avail. Eventually we enlisted the help of some strong passers-by. No matter what they say, New Yorkers can be great with strangers in a pinch. The truck was a full-sized moving truck and was completely empty. We laid some moving blankets down, placed the house on top and hoped for the best. It looked small in that truck! 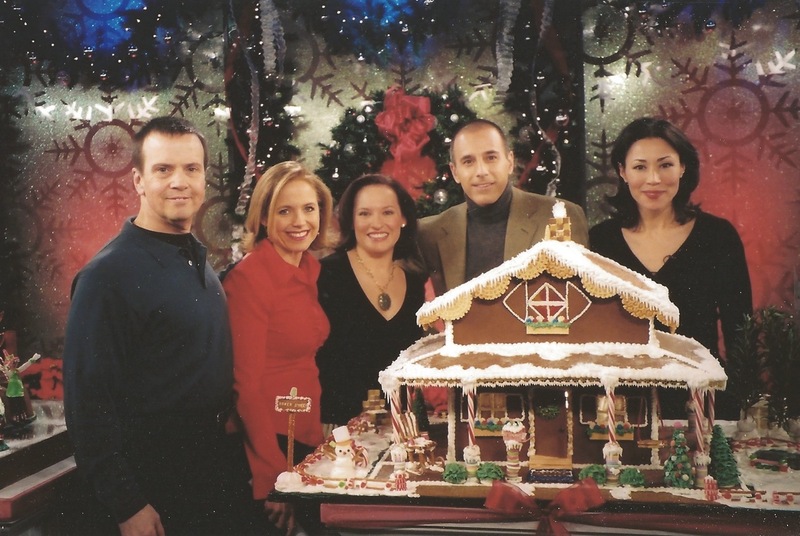 (Left to right: may partner David Kilroy, Katie Couric, moi, Matt Lauer and Ann Curry). The television segment was a success and we arranged for the house to be delivered to a children’s wing at a hospital when we were done. I am sure my gingerbread days are not over, but I can’t imagine what episodes will unfold in the future. Perhaps a life-size one like you see at Disney hotels during the holidays?